Scrutiny: Anna Hazare gets emotional at the special screening of ‘Chalo Jeete Hain’! Anna Hazare gets emotional at the special screening of ‘Chalo Jeete Hain’! 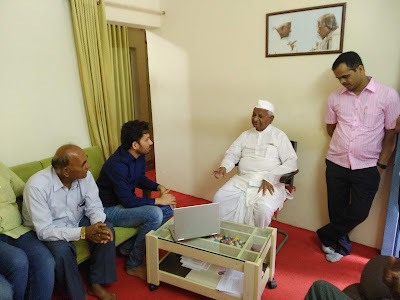 Film presenter-producer Mahaveer Jain recently held a special screening of his latest movie, Chalo Jeete Hain for social activist Anna Hazare and his team at his hometown, Ralegan Siddhi. Directed by Mangesh Hadawale and presented by Aanand L Rai, Chalo Jeete Hain is inspired from a childhood incident of Honourable Prime Minister Narendra Modi. While Anna Hazare was spotted teary eyed after the screening of the movie, he congratulated Mahaveer Jain, director Mangesh and presenter Aanand L Rai for the film that aims at spreading core message of selfless giving and kindness and imbibe the culture of living for others. Interestingly, the veteran social activist liked the movie to the extent that he has promised the makers to have various screenings for the school children in his home town. The inspiring film has got massive response nationwide and encouraging reviews from viewers thereby creating huge impact on the minds and hearts of millions. The first screening of Chalo Jeete Hain held last month in Mumbai witnessed the who’s who from the entertainment, corporate and political world including Amit Shah (National President BJP), Devendra Fadnavis (Chief Minister of Maharashtra), Finance Minister, Piyush Goyal, Sachin Tendulkar, Mukesh Ambani, Akshay Kumar, Kangana Ranaut, Ajay Piramal, Kumar Manglam Birla, Sajjan Jindal, Uday Shankar, Deepak Parikh, Gautam Singhania, Motilal Oswal and Prasoon Joshi and many more prominent personalities. Why Namish Taneja cancelled his birthday party? Gurmeet Choudhary’s unique fitness mantra! Sushant Marya roped in for 'Karna Sangini'..